Key Ingredients: Salicylic Acid (BHA) – an exfoliating ingredient that works on the upper-most layer of the skin as an anti-inflammatory, antibacterial and anti-fungal agent. It is an excellent ingredient for acne sufferers as it is able to draw out and remove dead cells and debris from congested skin follicles. It is also effective for individuals with rosacea, psoriasis and folliculitis due to its anti-inflammatory properties. Mandelic acid is an alpha hydroxy acid (AHA) extracted from bitter almonds which effectively addresses a range of conditions including hyperpigmentation, acne and fine lines. AHA’s work to accelerate cell turnover, helping to remove dead skin cells that can lead to dull complexions as well as fine lines. Mandelic acid also helps to support collagen to reduce fine lines. Application: Apply three times weekly for general exfoliation, or daily for moderate acne. 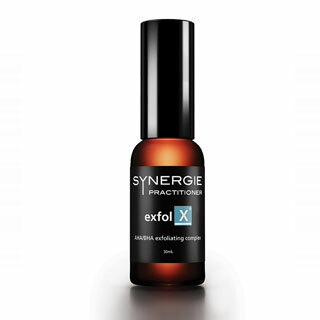 May also be combined with Vit-C plus crystals (1:4 ratio of Pure C : Exfol-X) as a home ‘minipeel’ for more robust skin. 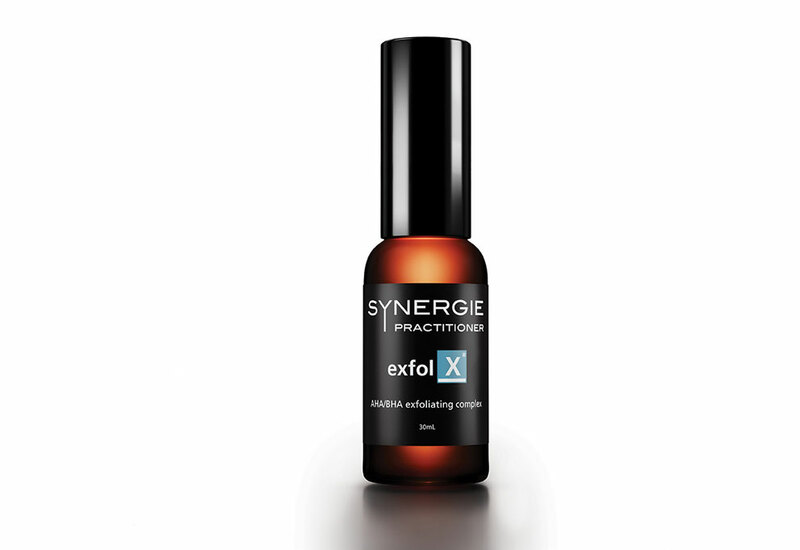 It is recommended that you apply ÜberZinc or Synergie Minerals foundation as your UV protection following Exfol-X. Do not mix with Vitamin A and B serums.